Photograph provided by the Club Bowling team. Although many may not know it, one of the most successful sports at Wright State isn’t a varsity sport, but instead a club. The Club Bowling team, who competes against varsity squads, brings home wins season after season. The club was started in 2005 and has continued to grow ever since, currently having a roster of 32 players. Tryouts for the men’s and women’s teams are every fall, during the first week of school. They have a very dedicated group of players who travel three times a week, to three different bowling alleys, to practice the sport. Currently, the women are ranked eighth in the country and have won five of the seven tournaments they have competed in this year, including the Ball State Cardinal Baker Classic. The men, who finished runner-up at nationals last year, are ranked 31st in the country. Individually, the team has players who do very well, including freshman Madison Stiffler, who is ranked eighth overall and is averaging a 198.7. “We bowl one of the most competitive schedules in the country. Last year we bowled in Ohio, Indiana, Michigan, Illinois, Wisconsin, Tennessee and Pennsylvania,” said Club President Jessica Pitt. In addition to winning, the bowling club has a great deal of fun. “My favorite part of the club is all the friendships you make on the team. We are like a little family,” stated Pitt. The club also does community service to give back, including the Jingle Bowl at Capri Lanes. The players come out and help run the youth bowling tournament every year; this year it will be on Dec. 8. Both the men’s and women’s club bowling teams hope to continue the success they have had in the past. 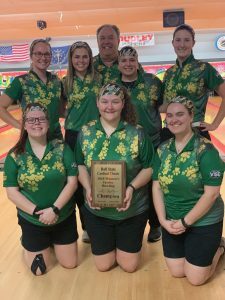 They compete in tournaments until the end of the school year, hoping to compete in the USBC Collegiate Nationals and the Collegiate Club Nationals.